Review by wonzii (Fin) on 3/8/2013. Review by Toxophilus on 11/4/2013. When you invade that last room with 2400 armies, there's something to be said about overkill. Review by Christopher Andrew Loewen on 11/4/2013. Wonderfully well done. A challenge in the beginning, overkill in the end. Review by indiman112 on 7/30/2014. Review by Damion Strife on 10/5/2014. Review by Mark The Destroyer on 11/30/2014. Very challenging. I thought I was out maneuvered several times, but I was able to give up some ground and re-enforce. Review by stjacky on 2/6/2016. Review by tbirdbrent on 3/7/2016. Review by jecowa on 4/8/2016. The connections confused me at first, then I realized that it's not the grey lines connecting buildings; it's the black spaces in between. There were still a few confusing places, though, such as the back seating areas of the auditorium not connecting to each other, even though they are all touching each other. The principal's office and similar being worth negative points was kind of funny. But then if you owned all the negative administrative areas, you got a nice bonus for taking over the command center of the building. Review by DonaldTrump on 4/26/2016. Review by Gunk on 12/16/2016. Review by Andalorium on 1/19/2017. 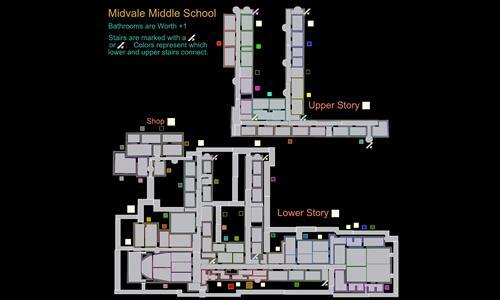 Decent map, the only way for it to be overkill is to take out one room at a time. Review by [REGL] Pooh on 2/21/2017. Some unclear connections. Okay gameplay. Review by A Misuse of Nomenclature on 10/13/2017. Review by Captchawizard on 10/20/2013. Very hard to discern where hallways led. Doors were not very clear.